Koriiatovych, Fedir [Федір Коріятович; Korijatovyč], ?–ca 1417. The nephew of Grand Duke Algirdas of Lithuania, in the 1380s Koriiatovych became a voivode of Podilia. In 1393 he was attacked by Grand Duke Vytautas the Great and fled to Hungary. 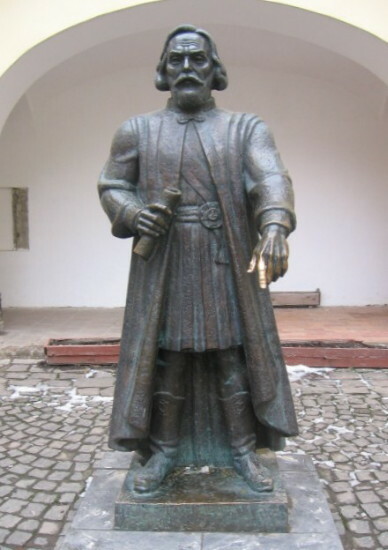 There he was granted the city of Mukachevo by the Hungarian king and became the ruler of Berehove komitat (zhupa), Zemplén komitat, and Máramaros komitat (see Maramureş region) in Transcarpathia. Koriiatovych founded the Mukachevo Saint Nicholas's Monastery. According to ancient chronicles, thousands of Ukrainians accompanied Koriiatovych to Transcarpathia from Podilia, thus giving rise to the theory of the Ukrainian colonization of the Hungarian foothills of the Carpathian Mountains.